Bring on the chilly weather! The best way to handle the temperature drop is by investing in chic knits and fuzzy sweaters. From pullovers, sweatshirts, vests and more, there’s no wrong way to layer up. The ultimate cold weather style we always keep in our closets, however, is a plush cashmere sweater. They’re chic, comfortable, designed to keep us toasty warm and are oh-so soft — can you blame Us for investing in a few for the winter ahead? See It: Grab the Vince Side Slit Wool Cashmere Boat Neck for 20 percent off the original price or $325, now $260 while it’s still in stock and enjoy free shipping and returns. Be sure to check out Zappos Luxury for other sale finds to add to your closet. The Vince Side Slit Wool Cashmere Boat Neck knit is a beautiful yet versatile design that will look great among our collection of simple (but stunning) knits. The cashmere and wool blend is designed to keep you perfectly warm on the chilliest days. We can’t wait to wear it with skinny jeans, booties, a top coat and a beret to rule the streets in style. Featuring a flattering boat neckline, long sleeves and side vents, this relaxed knit is the ideal match for our autumn ensembles. Its storm vent style back provides an extra layer that exudes a smart tailored finish. We also love that this piece offers a straight hemline that will have Us serving up a medley of layered looks. Whether tights, leggings or jeans are on the lineup for the day, this will pair beautifully either alone or layered over a blouse. The deep navy shade can go double duty from desk to drinks or even to lounging with at home under a cozy blanket. A fabulous find that will look amazing with fitted trousers, joggers, a miniskirt and more, there’s really no limit to how many ways you can wear the beautiful knit. The best part about the wear-everywhere piece is the price tag. Normally retailing for $325, we can scoop up this knit at a cool 20 percent off markdown, leaving Us with a $260 price tag. For a timeless design that’ll last us many winters to come, that’s a worthy investment! Want to wear the knit to the office? Up the ante with ponte pants, mules, a printed scarf, top coat and hobo bag for an office-ready look. For days when we’re enjoying a quiet night at home with a glass of vino and a good book, we’re wearing this offering with leggings and fuzzy slippers for a comfy feel. If you’re thinking of an outfit worthy of any street style star, try pairing the boxy knit with a beautiful silk skirt and ankle booties with an adorable kitten heel. Available in sizes small to extra large, now is the time to add this piece to our shopping cart ASAP. With such a major markdown, we don’t expect this style to be in stock much longer. If you want to show a touch more skin, we strongly recommend opting for an asymmetric off-the-shoulder sweater — namely, the Vince Off Shoulder Pullover. Made with a super soft wool and cashmere blend, we can count on this number to keep Us warm all season long. Designed with a cold shoulder accent at the right, this flirty number will certainly shake up our wardrobe. We love that this piece offers a ribbed collar, cuffs and hem for a beautiful textured finish. Complete with long sleeves and a pull-on style, this design will look great paired with anything from jeans to midiskirts and leather leggings. Available in two neutral hues including black and light heather grey, the versatile piece is sure to get plenty of style miles in our wardrobe. 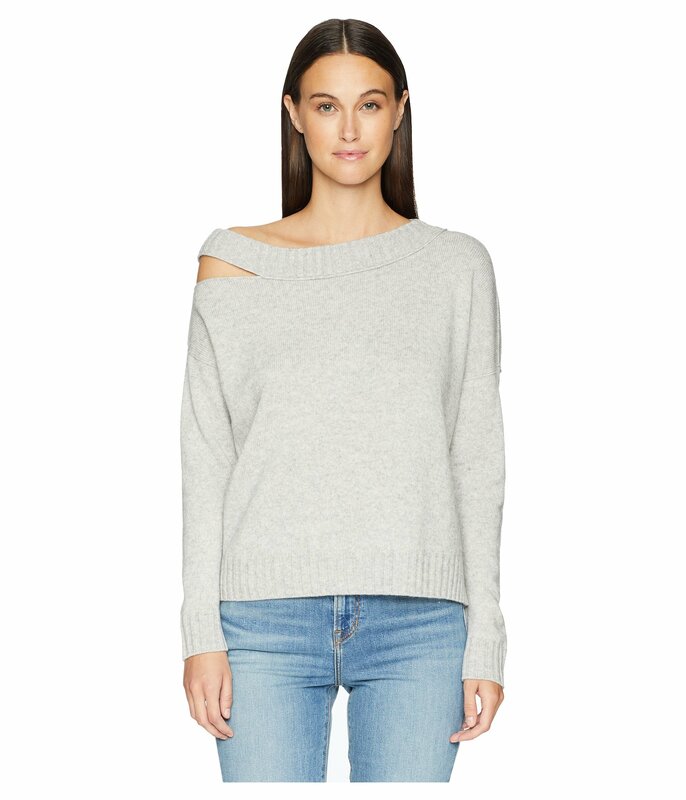 See It: Grab the Vince Off Shoulder Pullover at 20 percent off the original price of $295, now $236 in light heather grey and black. Enjoy free shipping and returns with each purchase.